Secretary Ross will cover department reform, budget, and economic development projects ongoing in the state. Dave Ross was appointed by Governor Scott Walker to serve as Secretary of the Wisconsin Department of Transportation (WisDOT) beginning in January 2017. WisDOT is one of the largest state agencies, with about 3,500 employees and an annual budget of more than $3.5 billion. The department supports all modes of transportation, including state highways, local roads, railroads, public transit systems, airports, and harbors. In addition, the department includes the Division of Motor Vehicles which serves about 50,000 customers each week and the Division of State Patrol that enforces laws and assists motorists throughout the state. Secretary Ross first joined Governor Walker’s cabinet in January 2011 as Secretary of the Department of Safety and Professional Services. DSPS is responsible to help ensure the safe and competent practice of licensed professionals in Wisconsin while enforcing laws that support safe and sanitary conditions in public and private buildings. 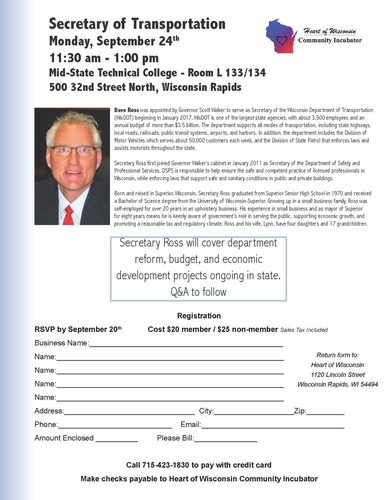 Born and raised in Superior, Wisconsin, Secretary Ross graduated from Superior Senior High School in 1970 and received a Bachelor of Science degree from the University of Wisconsin-Superior. Growing up in a small business family, Ross was self-employed for over 20 years in an upholstery business. His experience in small business and as mayor of Superior for eight years means he is keenly aware of government’s role in serving the public, supporting economic growth, and promoting a reasonable tax and regulatory climate. Ross and his wife, Lynn, have four daughters and 17 grandchildren.